How do I force Outlook to use a given proofing language all the time? I have Outlook's default language set to one language, but when I reply to an email written in another, my proofing switches to that language. In my case, the languages are English (US) and English (British). I'm using Outlook 2007, and all my windows region/locale settings are set appropriately. Click Set Language Button image. Un-check the Detect language automatically check box. 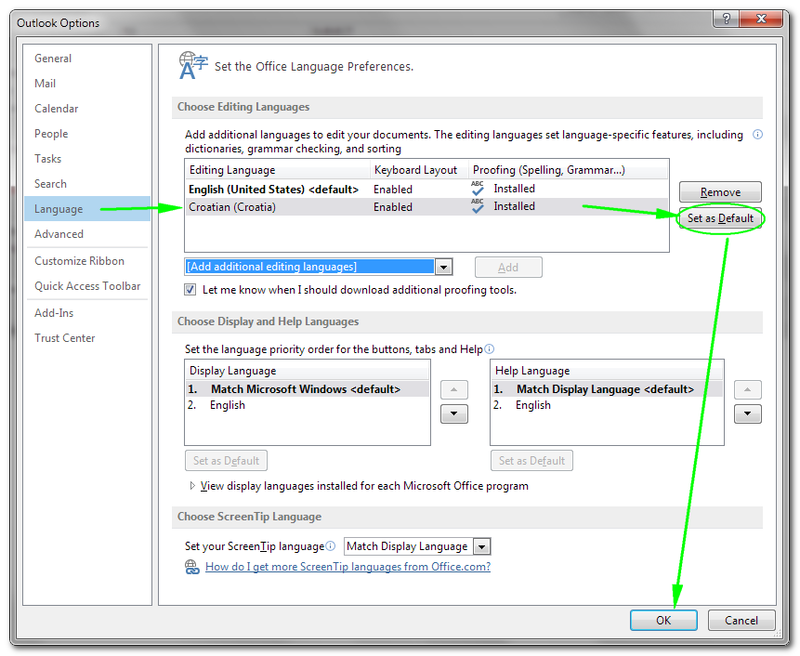 Editing Languages -> Set "Primary editing language"
Editing Languages -> Remove undesired language from "Enabled editing languages"
I'm using Outlook version 14 packaged with Microsoft Office Professional Plus 2010. In order to force the proofing language to be my dialect of English, I choose "File > Options > Language", then (if it's not already present, "[Add additional editing languages]" and) specify my language as the default in the "Choose Editing Languages" pane, and remove the other languages. Outlook requires a restart after this change. while that dialog is still open: "Set as default language" = yes, "Detect language automatically" = no. After app restart works on new messages. When using Office programs, the proofreader always switch to the language selected in the language bar. If no language bar is present, you have only one language selected on windows and office programs' proofreader switches to this language. Go to settings > Region & Language. In "Keyboard and Languages" > click Change Keyboard. click the "+ button for the language that you want to spell check in". Select the keyboard you have. Now click "ok" and you are done. You can then also move you alternate keyboard language up into default position by clicking on it and clicking "Move Up". so you could have English language with Spanish keyboard or vice versa. Not the answer you're looking for? Browse other questions tagged microsoft-outlook microsoft-outlook-2007 spell-check or ask your own question. How to set proofing language regardless the keyboard layout on Windows? How do I make my gmail account the default account in outlook? Can I keep Outlook 2007 from adding my name to recipient list when replying to all? Can I make Microsoft Office ignore Windows language settings?